Another year has come and gone, and with it came some great movies. As we head into awards season, here’s a rundown of some of the cinematic triumphs of the past year. One of two films released this year based on the life of Christine Chubbuck, a news reporter who committed suicide live on television, Christine’s genius sits on the unbelievably nuanced performance by Rebecca Hall, who plays the titular Christine. While many critics are pointing to the other film inspired by Chubbuck’s story, Kate Plays Christine, as the superior film, Hall’s performance is enough to carry any of Christine’s few flaws and more. The film travels through Chubbuck’s struggles with human connection and mental illness so that while you know how the film is going to end, you’ve grown to at least feel for Christine, and it really hurts to watch anyway. The only documentary on this list (although it wouldn’t be if this list was longer – Weiner and Cameraperson were also great), and one of only two films on this list that you can watch on Netflix right now. Ava Duvernay (the director of 2015’s Selma ) directed this powerful unpacking of America’s difficult history with mass incarceration and racism. Named after the 13th amendment, this documentary is well-paced and accessible despite being incredibly information-dense and packed full of interviews with academics and activists. The Witch (sometimes stylized as The VVitch) follows a 17th century New England family who have chosen to distance themselves from their church and live isolated on a farm due to a difference in certain religious beliefs. In a different film, this could be the plot of a mundane TV drama. In this film, their isolation breeds slow-burning paranoia that explodes into horrifying violence. In what may be the worst decade of horror in American film history, The Witch is such a welcome relief because, above all, it’s scary. It’s so scary. This movie has everything: Satanism, a dark and endless forest, original sin, a goat that ends up saying some creepy stuff, and, of course, witches. As cruel and unrelenting as it is funny and lovable, The Lobster follows a heavier-set mustachioed Colin Farrell as a single man in a world where people who remain single too long are transformed into animals and left to fend for themselves. The absurdity of this concept works to the film’s advantage, as that suspension of disbelief allows room for the best dark comedy of the year. Watching Colin Farrell stumble through reluctant heroism is cathartic and deeply strange. If you’ve been following other “best of” lists, this may not come as a surprise to you, but Moonlight’s accolades are absolutely deserved. 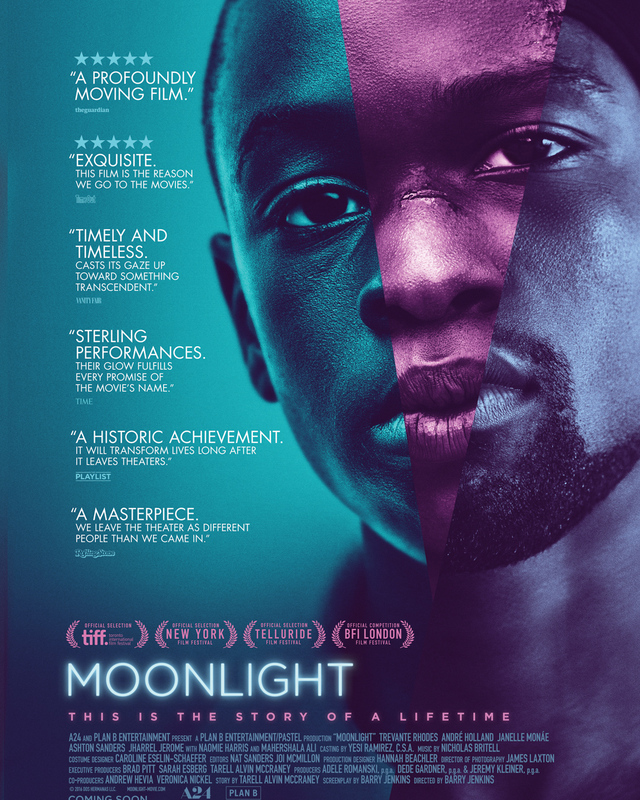 Moonlight follows Chiron (played by three different actors in different stages of his life) as he navigates through the world as a queer black man. The film approaches (to say “tackles” is too strong a word, as the film, fortunately, pushes no agenda) Chiron’s sometimes painful search for peace and identity in a world that often confuses and disappoints him. The movie approaches everything in Chiron’s life, from his sexuality to his painful interpersonal relationships, with an empathetic eye. His kind and charismatic father figure is a drug dealer, his mother is an addict, but Moonlight never falls into the formulaic traps these characters are too often written as in Hollywood. Many critics have claimed it somehow “transcends” race or sexual orientation, which is incorrect. The film is not about “transcending” these factors of ourselves so crucial to our identity, and in fact beautifully explores how these facets of our being shape our humanity. Moonlight is compassionate, haunting, gorgeous to look at, and required viewing for any film enthusiast.